Amidst her busy schedule performing concerts on her tours around the world, pop royalty Taylor Swift does not forget to spend some quality time with her loved ones. The singer took it to Instagram to show how she spent Sunday morning after her sold-out performance in Hyde Park attended by 65,000 fans. 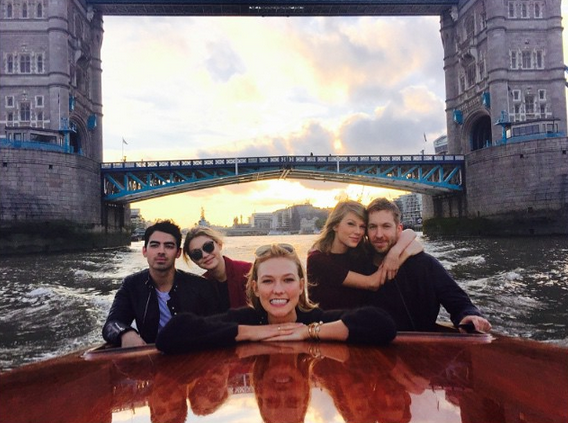 She posted a picture with beau Calvin Harris, best friends Karlie Kloss and Gigi Hadid, and ex-boyfriend Joe Jonas with the caption, “Little known fact: Karlie is secretly an unofficial historian/London tour guide. Kind of.” The group was reportedly on Thames Limo, a private luxury charter where they were joined by Swift’s parents, Scott and Andrea. She also posted a photo of her concert the previous night where she brought up on stage Hadid and Kloss together with other friends, models Kendall Jenner, Cara Delevingne, Martha Hunt and tennis player Serena Williams. Swift and DJ boyfriend Harris were recently named by Forbes as the world’s highest paid celebrity couple for this year. According to the report, with Swift’s current world tour and endorsements for Diet Coke, Keds and Sony, and Harris with Giorgio Armani and Sol Republic, the couple has an estimated combined annual income of $149 million. 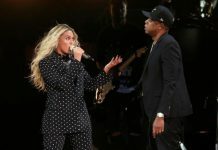 They were followed by Beyonce and Jay-Z, who held the title previously with $110.5 million. The relatively new couple was said to begin dating on March. They recently made their relationship public by posting pictures on social media. Moreover, at her Glasgow concert, Swift seemed to drop hints about her boyfriend as she reportedly said to concert goers that, “Look at all of these amazing Scottish people in this room right now. I happen to love Scottish people, personally.” Harris comes from Dumfries, Scotland, Hollywood Life reports. She also revealed on that night that, “My dad sent me an email. It said our whole family is from Scotland, so I evidently am one of you,” the report added. Next articleSword Art Online seasons 3 and 4: May see adventures of Kirito in the Underworld; Alicization as the main plot?